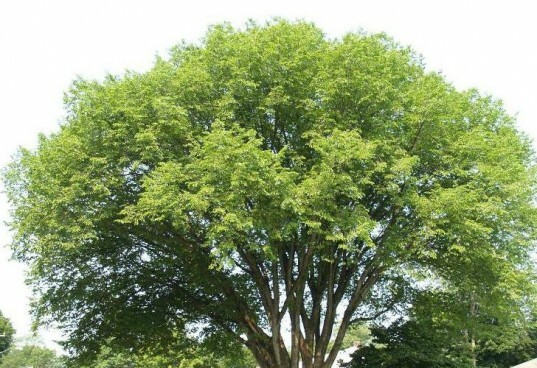 Planting and Maintaining an Elm Tree | Schulhoff Tree & Lawn Care, Inc. Healthy and appealing trees add a great deal to your home. While they create texture, shade, and even color, mature trees can also add a good amount of value to your home. If you want to plant trees to add home value, you may be wondering what trees will work great in your yard. With its lush foliage and fast-growing nature, the elm tree is a great option to consider. Of course, proper planting and maintenance are key if you want your elm tree to not only grow but also thrive. This guide and the help of professionals will ensure your elm is planted and grown in the most effective and healthiest manner possible. Location is one of the most important factors to consider when planting an elm tree. Because certain varieties can grow up to 120 feet tall and have a massively-wide canopy, choose a location that is not too close to power lines, your home’s exterior, or other outdoor structures. Elm trees grow well in both full sun and partial shade. In regards to soil conditions, the elm prefers well-drained soil to reduce the risk of excess moisture that could lead to fungal growth. Timing also matters when planting your elm tree. Spring and late fall are the best times to plant elm trees, since the weather is not too hot or too cold, reducing the risk of shocking the tree’s root system. Surround your new elm tree with mulch after planting. This mulch adds a decorative touch to your landscape design, but its main purpose is for trapping in moisture, helping the elm tree’s roots establish themselves into the soil. In periods of drought, water your newly-planted elm tree once a week. Once established, you can reduce how much you water. Fertilizer is also important for helping your elm tree grow and live for many years to come. Unfortunately, fertilizing can also be a challenge for many homeowners, especially if you do not have experience with elm trees. While underfertilizing can affect its ability to grow, overfertilizing can harm your tree. Therefore, applying the right fertilizer at the right time is essential. Experts recommend using a slow-release fertilizer designed for shade-producing trees. A higher amount of nitrogen will be found in these fertilizers, but this nutrient is released slowly over time, reducing any stress to the tree and its root system. Apply a fertilizer at least once a year. The fall season is ideal because the ground is still soft, which will ensure the nutrients are absorbed into the ground and tree’s root system. Pruning is also an essential part of growing and maintaining your elm tree. One of the greatest benefits of proper pruning is reducing the risk of damage that may occur as the tree grows. As your elm grows tall, it also grows wide, creating a wide and heavy canopy. Although strong, the elm tree’s trunk may not be able to support the wide and heavy canopy. This extra weight places stress on the trunk and other limbs, causing branches to break off and fall. Each year between the months of September and March, have low-lying branches pruned, helping elevate other branches while creating a sturdy and stronger trunk. Pruning is also necessary for removing branches and limbs infected by disease, fungal growth, or pests. Make sure to remove all branches and limbs that are discolored, decaying, or damaged. This will stop the disease from spreading further into the tree while reducing the risk of disease and pests harming other plants and trees in your landscape design. For more information on planting or caring for your elm and other trees, contact Schulhoff Tree & Lawn Care, Inc., today.